This tutorial uses the same basics as this tutorial. You can click HERE to see more step-out photos. My canes are usually small canes, good for 3-4 uses only. The total amount of clay in the picture at the top left is less than one ounce and will make approximately 24 petals at 1/2″ tall each. Run your triangles (or teardrops) through the pasta machine on a medium setting. Keep running your blend through the pasta machine until your blend is even and the colors merge & combine seamlessly. (About 25-30 times). Now use the fan-fold technique to make a Skinner Blend Stack. Choose ONE end of this stack and run through your pasta machine at a thick setting. Continue to repeat this step placing clay in the same direction as the first time, but with each pass make the thickness of your blend smaller. Once your clay is in a nice super-long strip going nicely from one color to the next. 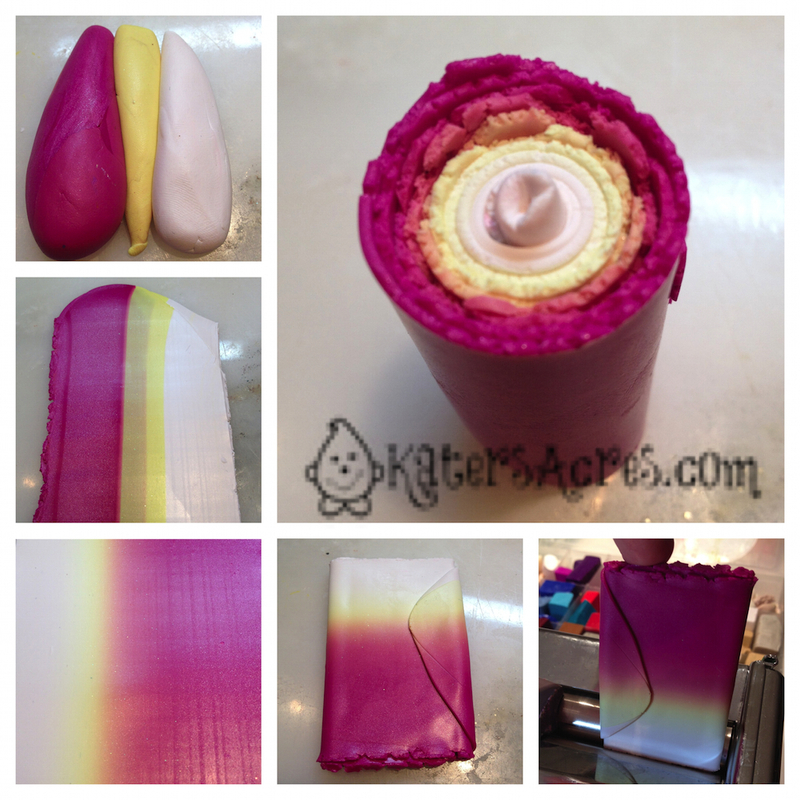 Use the fan-fold technique to fold the clay in one inch sections. 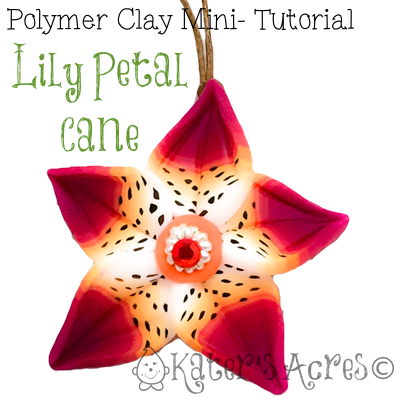 On each layer, add 2-4 black strips of clay as the “dots” on the lily petals. When you are finished you should have a stack that has “dots” from the bottom to just over half-way (bottom left picture above). Form into an oval shape and reduce until size is where you want it to be. Each of my canes are about 1/2″ to 1/4″ tall. Use as desired to make flowers, beads, pendants, & so much more. Are you wondering what you can do with this cane? You can make pendants, beads, & so much summer-themed jewelry. You can also incorporate these canes into your sculptures. Use your cane ends to make Natasha beads. Use them as component pieces in kaleidoscope canes. Use them as portions of butterfly wing canes. Use your imagination, but have fun!